Rosny Child Care Centre opened in 1988. We are a not for profit, community based centre owned and operated by the Clarence City Council. Rosny Child Care Centre provides high quality care for your child and support for you and your family. We provide a warm, caring environment where each child is encouraged to learn and develop at his or her own pace. Our Centre is located on Loinah Road in Montagu Bay. 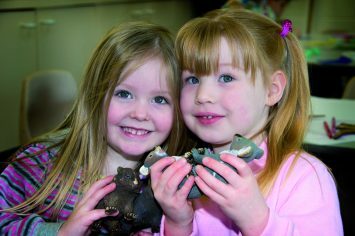 We offer a program that provides a variety of opportunities to learn through play and that fosters each child’s unique abilities. 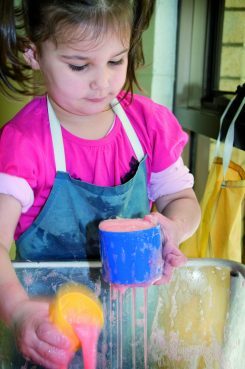 The program includes creative and engaging activities, imaginative play, music and movement, stories, excursions, and quiet times. The centre is staffed by caring, friendly, experienced educators. All of our educators have qualifications in child care or early childhood education. 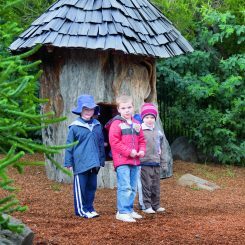 Our playground is a bush style garden with unique play equipment that enhances the natural setting. Children have the opportunity to play among the many trees or in our two sandpits and to help care for our vegetable garden. We have a range of mobile equipment that we set up on our soft fall area to further challenge the children’s skills. Initiative, independence, responsibility, co-operation, resilience, and a respect for people and property are actively encouraged. Our small size means that a real sense of belonging is achieved. Children have many opportunities to spend time through the day with children and staff from other rooms. All meals are provided by the centre with our cook preparing fresh meals each day that are delicious and meet the children’s nutritional requirements. We can cater for children with food allergies and intolerances. Our fees are competitive with other local centres.Parents may be eligible for fee assistance in the form of Child Care Subsidy. Parents who are studying or entering the workforce may also be eligible for a JET fee subsidy. Further information can be obtained by contacting Centrelink on 136 150. Rosny Child Care Centre is an approved service under the Education and Care Services National Law and meets the operational requirements of the National Regulations and Quality Standards. For further enquries about Rosny Child Care Centre please contact us on 6288 8628.